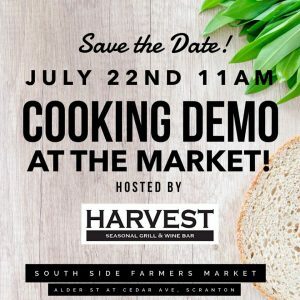 The Harvest Seasonal Grill & Wine Bar will host a Healthy Cooking Demonstration Saturday, July 22nd at 11:00 am during the weekly South Side Farmers Market on Alder Street at Cedar Avenue, Scranton. The Harvest Seasonal Grill & Wine Bar is our area’s newest Farm-to-Table restaurant located in Moosic PA. They will be demonstrating how to make their Nutty Watermelon Salad with Lime Vinaigrette. Participants can try a sample and take a copy of the recipe home.